✔ SIZES: 5/16 x 3-3/16''(8 x 80 mm). ✔ MATERIAL: Made of 304 stainless steel that protects against corrosion. ✔ MULTIFUNCTION: Versatile binding, rigging and anchoring hardware - allows fastest connect/disconnect. 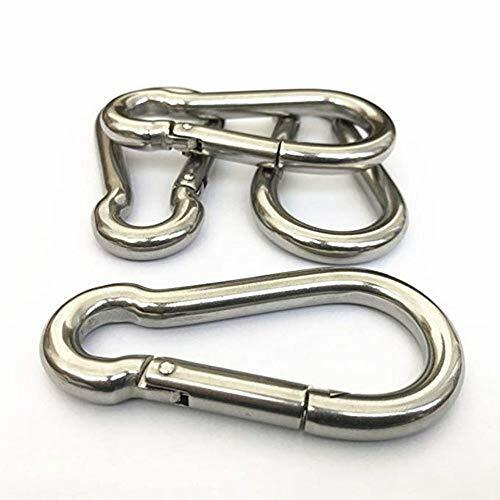 Great for dog leash, camping, fishing, traveling, hiking, connecting items to a belt and any outdoor use. ✔ HIGH-SAFETY: Open-auto-close spring gate with interlock tooth prevents load forcing open. ✔ GUARANTEE: We provide a No-question-asked RETURN or REFUND service if not satisfied.